Family Volley: FAMILY FUN FRIDAY-Candy Carry! Friday already? Where did the week go? Here is the perfect game for you and your family to play this weekend. Spend some time together. We like to use plastic. They are easier for our kids to hold in their mouths, and if you drop them they don't hurt if they land on your toes. It can happen. 1. Have your family line up. 2. 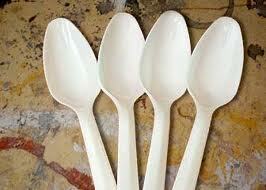 Each participant will put a spoon in his/her mouth. Holding the spoon with their teeth/lips. 3. The first person in line puts the Mentos on their spoon. 4. Then...using only the spoons, the candy has to be transfered from spoon to spoon (person to person). Remember, no hands, you can only use the spoons to pass the Mentos. If the candy is dropped, give it back to the first person and start again. Split your family up. Put a few people on one side of the room, and a few on the other. The first person puts the Mentos on their spoon and has to walk across the room to the next person, without letting it drop. They pass it spoon to spoon. Once the person on the other side of the room has it on their spoon, they have to walk across the room to the next person and repeat. 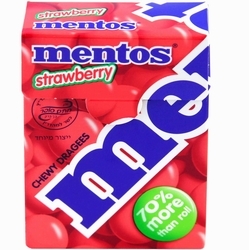 Walking with the Mentos adds a great challenge to the game. You can also pass the Mentos and then have to drop it into a container on the other side of the room. Any candy will work for this game. Conversation Hearts would be perfect. After all, it is the Season of Love. Experiment with anything in your cupboard. If your family is large, make two teams and race. First one to get the Mentos passed to the end of the line and back, WINS! If your family is small, race against the clock. See if you can beat your time each round and not drop the candy. Our two year old can play this game with us, but she needs some help keeping her spoon steady. So, her job is to put the candy on the spoon to start the game. She loves it, and thinks she is really BIG. Anytime we drop the candy, she gets to pick it up and put it back on the first persons spoon. We are taking all the kids skiing on Saturday. It will be our two year olds first time on skies. We can't wait. This sounds like such a great activity. We might have to try this since we're on yet another snow day today. No school for 4 days means the kids are getting cabin fever.